What I love about being a blog writer is that I can write about any topic that comes to my mind. Because of this very interesting world we live in, almost everyday, I am inspired to write something new. Today's subject was inspired by a conversation I had with a group of women and the topic was about love and money. If you happen to be man then you should know, that having a conversation with a group of women can be very difficult. Why you may ask? Because most women stick together like glue and even if some of them happen to be wrong, most of them will argue with you until the sun comes up. (smile) Anyway, while talking to a group them the subject came up about money or love. I asked them a couple of questions about their love life and then asked them could their love be bought or purchased? I also asked them because many of them had very large diamond rings on their fingers and also that it was a known fact that many of them dated or were married to men with money. So I asked them was it a requirement that their future husband or current husband buy them those expensive rings? Then I asked them would they date or marry an ordinary man or a man without money? Then I asked them do they marry for love or for money? Like most ordinary women, they were ready for a fight and being that I was the only man between four women they figured that they had the advantage. What these women didn't know, that they were talking to a very intelligent man, that's a thinker, who really enjoys a good debate and enjoys having interesting conversations. They also didn't know or realize that our conversation would be the next topic on my blog. (smile) Now back to the subject and the reason why we got into it in the first place. At first we were talking about the reasons men or women fall in love. Most of the women that were at my table felt that most men were only interested in their bodies or for their looks. I , on the other hand had said, that some, not all women were in love with a mans money or material passions. Then I also was trying to explain, that when it comes to love most of us men are not just interested in a woman's body or appearance. In fact a lot of us men only look for women that, can add a little something to our lives. The problem I explained to the ladies at the table, were that when we are out on a date with a woman, one of the very first questions that are asked is, where do you work or how much money do you make? Without asking simple things, like who are you and what is your name? What do you like or do you believe in God? Do you like children or are you close to your family ?These questions were bypassed and most dates that I have been on or the ones my male friends have had, always centered around money. Its funny, but when a person usually goes on a date with someone they are interested in, its with the hope of finding true love. The question is why do most of the conversations start off with where do you work at or how much money do you make? And then the main question the women at the table couldn't seem to answer, if you are seeking a man to love, then why are you more concerned with what he does for a living, what type of car he is driving or how much money does he make? This is an open discussion to any woman that may read this? 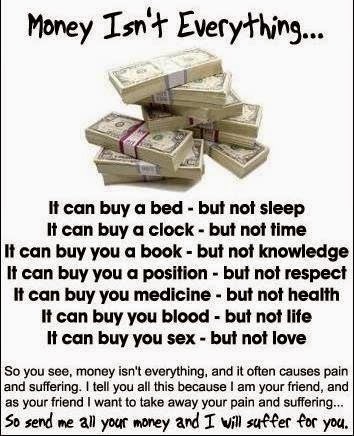 Money can't buy your love or could it? The real reason why I have asked these questions is because in the grand scheme of things what a man does for a living or how much money he makes doesn't make him a good man. Also just because a person can take care of you in one area doesn't mean they are capable of taking care of you in others. Besides that just because someone buys you material things or gives you money doesn't mean that they love or will stay with you. In fact the only thing that really matters is what's in a persons heart. While you think or ponder what you just read, I would like to leave this statement with you. Things that are bought or purchased are easily discarded, but things that are loved or worked for are kept forever. 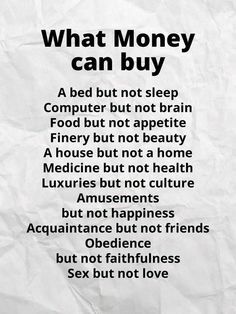 Money Can't Buy Love Or Can It? Write in and express your thoughts or opinions on the subject.